Long, straight shots with “a lot of green” are some of the most intimidating shots in pool. You would think that since the shot is straight in, it should be easy, right? Well for most of us, it isn’t easy. Even high level players can have trouble executing these shots and the reason is due to a fundamental error in alignment. It’s called Vertical Axis Perception Error, which means that you aren’t actually hitting the center of the cue ball when you think you are. This is an error that affects 75% - 80% of players and they don’t even know it! PBIA Master Instructor and founder of the National Billiard Academy, Tom Simpson, corrected this issue for thousands of pool players over the years and in this article, we have combined a couple of his Ask The Master submissions relating to this topic of “how to shoot the cue ball straighter.” Read on and you’ll learn the physics of why these shots are so difficult, how to identify if you are not hitting center ball and most importantly, how to correct your form in order to shoot straighter. Enjoy! Ask The Master - "My name is Tim, I am trying to improve my game to get to the next level. It seems like sometimes I can't shoot a straight shot to save my life. How can I work on that to be a more consistent player and win more games?" First off, Tim, let me say that straight-in shots are harder than most players expect. How often do you hear, "How did I miss that? It was straight in." 1) Straight-in is the cut angle at which sidespin has the greatest throw effect on the object ball. 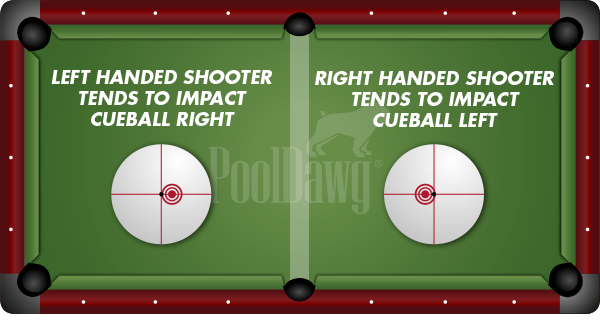 This means any sidespin the cue ball has when it arrives at the hit will produce visible throw. 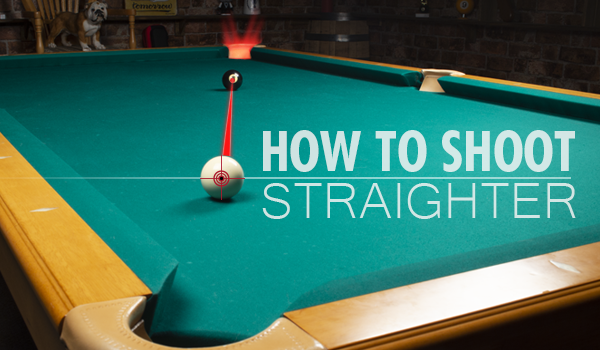 2) Straight-in shots become more difficult as the object ball gets closer to halfway between cue ball and pocket. 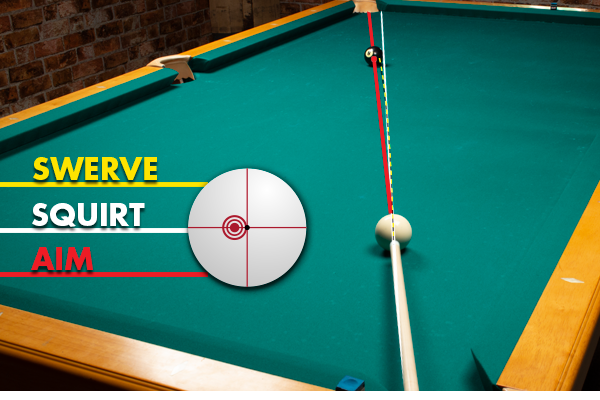 The toughest, least forgiving version of a straight-in shot is when the object ball is halfway to the pocket. That is good to know. So, my hypothesis is you are noticing your problem on straight-in shots because the results are so clear and revealing. You know the object ball was supposed to go straight. On missed cut shots, we typically assume we misjudged the cut angle. Maybe not. Maybe you have the same error all the time. About 75% of the players that show up at my 3-Day Intensives have a problem I call Vertical Axis Perception Error. These serious players believe they are hitting the vertical center line of the cue ball, but the truth is they are always off to the side. Always the same side, always the same amount. The trouble is, it looks like center to the player, and as a player, you have to trust your vision. The vertical axis can be hard to see. Try lining up the top of the cue ball with the top of the object ball. That tip offset causes unintended squirt and spin (or swerve), both of which can make a dramatic difference on straight-in shots. The farther apart the cue ball & object ball are, the bigger the problem is. Right handers with this issue typically are hitting left of the vertical axis and seeing it as center. Hitting off the vertical axis can create squirt that will change the line the cue ball travels. Although the spin created will “swerve” the ball path back towards the aim line, it isn’t enough in the above example. Ask The Master - "I am a left-handed player and I am having difficulty with slight angle cut shots, 45 degrees or less. For some reason on shots from the left to right, I calculate my contact point and then my aim point, but my aim point has to be further right than you would think. If I don’t do that, I will overcut it. Why does this happen?" NOTE: This question was asked by a lefty, but the answer applies to both left-handed and right-handed shooters. This is a frustrating problem and one that 80% of the players that show up at my pool school have. Almost none of them are aware of it! Many players have more trouble with “back cuts,” cutting toward a pocket that’s not quite in sight. But if I understand your description correctly, this sounds like a bigger issue. Without actually seeing you set up and shoot, here’s my best guess at what’s happening. It’s a perception and setup issue that I call the Vertical Axis Perception Error. 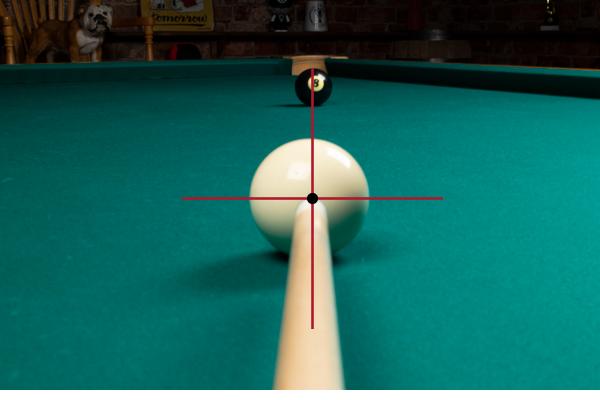 It is caused when your eyes are not correctly aligned above the shot line so that your brain can accurately see the center of the cue ball. We refer to the correct alignment location as your Vision Center and it can be different for each player. For some players, it’s under an eye. For others, it’s elsewhere. To correct this, we have to identify your personal Vision Center and get it over the stick. Let’s look at the symptoms first. Among players with this issue, right-handers usually hit the left side of the vertical axis of the cue ball and it looks to them like they are hitting center. Left-handers hit the right side. We trust our eyes that we’re lined up to the shots as we see them, but maybe we’re just not seeing them correctly. If we aren’t hitting the cue ball on the vertical axis, it will be hard to trust your aim because of squirt and throw effects. Squirt occurs when you do not hit the vertical axis of the ball. If you strike even slightly to the right side of the ball, for example, it will head off on a line that’s a few degrees to the left of the stick line. It will also have right spin, in this example. Also, the farther away the object ball, the more squirt, and the worse the miss. Sometimes, putting a little spin on the cue ball will help correct the shot through the spin-induced throw effect. For example, if you apply a little left spin on the cue ball, the cue ball can pull the object ball angle a few degrees to the right, which sometimes cancels out the squirt error. Speed is also a factor because if you hit softly, the spin will have more time to curve the cue ball back toward the stick line. This is part of why sometimes the shot will work and sometimes it won’t. Speed and spin can mitigate the squirt error. 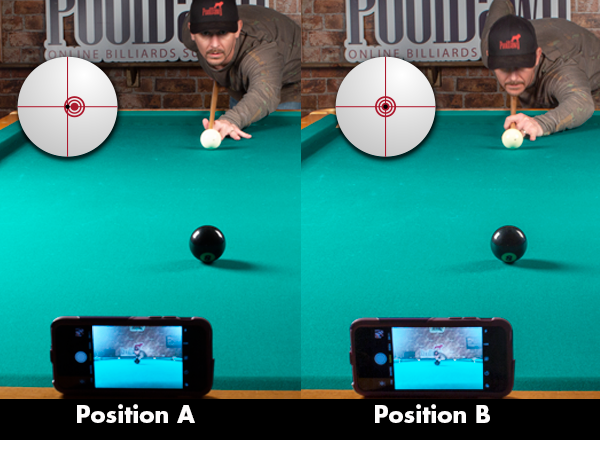 Frank Says: "If you want to get the FULL picture of your stroke mechanics, hook up the QMD3 Stroke Analyzer to your pool cue and install the software to your Android or iPhone to see exactly what you need to work on!" I identify and correct this issue on every player I work with. For those who have played a long time, it’s particularly frustrating that they are so inconsistent. You have to get your eyes in the correct place for your brain to be able to accurately see where the cue ball’s vertical axis truly is. This means moving your head to a slightly different location above the stick. Everyone is different, so I can’t tell you exactly what to do here. In person, we’d work through a few head adjustments and identify which one corrects you perfectly. Since we’re working in print, I’ll offer the simplest adjustment for you to try on your own – head height. Set up the cue ball near one end of the table and an object ball near the other end, more or less in a straight line up and down the table. Go down on the shot, lining up your stick dead center through both balls. Stop with your tip near the cue ball when you believe you have the alignment. 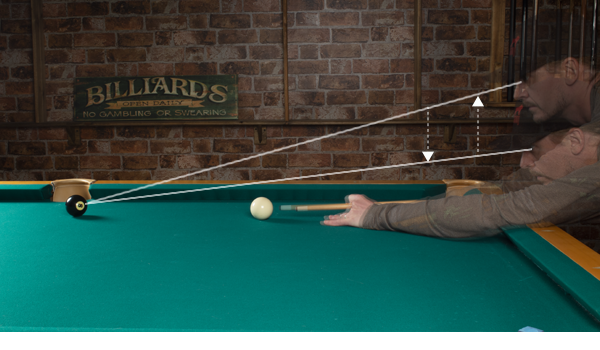 You’ll need to have someone stand at the far end of the table so they can see if your tip is centered on both balls. I expect they will tell you your tip is somewhere to the side of the vertical axis of the cue ball, which you will probably find hard to believe. Set up a camera in line with your shot to see for yourself if you are actually lined up the way you think you are. In Position A, the tip was slightly right of center. Dropping the chin down corrected that perception error. Everyone is different and we require distinct adjustments, so you must test yourself! Head height is the first and easiest adjustment to try. If you are a player whose head is very low (we refer to those players chin-draggers), try bringing it up a few inches. Set up centered on the straight shot again, viewing it from your new, experimental head height. Have your friend at the other end of the table confirm that you actually changed your head position and tell you whether your tip position has changed. Conversely, if you are a more upright player, try bringing your head down a few more inches toward the stick. First, try adjusting head height to correct your sight alignment. This will typically correct the Vertical Axis Perception Error.